GB Railfreight is a rail freight company in the United Kingdom. It is owned by EQT Partners through its subsidiary holding company Hector Rail Group. GB Railfreight was founded in 1999 by GB Railways. Unlike competitors DB Schenker and Freightliner, the company was not formed from parts of the privatised British Rail freight sectors. In April 2000, after winning an eight-year contract to operate infrastructure trains for Railtrack, GB Railfreight ordered seven Class 66 locomotives. An operator's licence was granted in July 2000. Operations commenced on 1 April 2001. In February 2002, GBRf commenced operating its first Intermodal container contract from the Port of Felixstowe for MSC Mendite. Also in 2002, GBRf began its first bulk freight contract for British Gypsum. In August 2003, GB Railways was purchased by FirstGroup and GB Railfreight was rebranded First GBRf. In April 2004, GB Railfreight commenced operating a five year contract for Network Rail with four Gatwick Express Class 73 locomotives. In May 2005, First GBRf began operating Royal Mail services using Class 325s. This was later extended until 2010. Also in 2005, GBRf commenced operating London Underground infrastructure trains for Metronet. In March 2007, First GBRf commenced operating coal trains for Drax Group and EDF Energy. In June 2007, the business was renamed First GBRf. In 2009, First GBRf was granted a passenger licence allowing it to operate charter services. Between December 2009 and July 2010, First GBRf operated passenger services under contract to First Great Western. The services from Cardiff Central to Taunton operated with hired Virgin Trains Class 57/3s hauling Mark 2 carriages. In May 2010, FirstGroup put the business up for sale. Eurotunnel, Freightliner and SNCF were reported as being interested in the company. The company was purchased by Europorte, a subsidiary of Eurotunnel, on 1 June 2010. Following the acquisition by Europorte, the company reverted to its original name and a revised version of the original livery. In February 2011, GBRf commenced operation of rail traffic at Cardiff Tidal/Tremorfa Works. In 2012, GBRf commenced a ten-year contract to operate the 43 mile rail network at Sahavirirya Steel Industries Lackenby steelworks, Teesside. In April 2015, GB Railfreight commenced a contract to haul the Caledonian Sleeper. Class 92s haul it from London Euston to Edinburgh Waverley/Glasgow Central with rebuilt Class 73/9s to haul it from Edinburgh to Aberdeen, Inverness and Fort William. Until the latter are completed Class 67s continue to operate the latter services. GB Railfreight have also won a contract to haul Class 800/801s. This will involve GBRf providing crews for the testing of the trains as well as hauling the sets. In October 2016, Eurotunnel announced it was in negotiations to sell the business to EQT Infrastructure II. To commence operations, seven Class 66/7s were ordered. Subsequent orders brought the total purchased to 72 by the end of 2014 with a further seven due in 2016. In October 2012. three unused Class 66s ordered by Crossrail Benelux, but stabled in the Netherlands were purchased, and later in 2013 a further two Class 66s that were previously in service in Europe were also obtained. GB Railways had purchased six former Gatwick Express Class 73s. After GBRf won a contract to operate Network Rail infrastructure trains in the south -east, four were overhauled by Frangonset Railways. GB Railfreight has 16 Class 92 locomotives acquired by Europorte before the purchase of GB Railfreight. GB Railfreight has also utilised heritage diesel locomotives. Class 20s are used on London Underground S Stock moves between Derby Litchurch Lane, Old Dalby Test Track and London Underground’s Neasden Depot. It hires these from various owners including Harry Needle Railroad Company. Since mid-2014, five Class 47s have been hired from Riviera Trains. It has also hired in preserved locomotives, including 55022 and D1015. GB Railfreight also has a pair of refurbished Vanguard 0-6-0DH locos (re-numbered DH50-1 and DH50-2) for use at Tremorfa/Cardiff Tidal works. To operate services on the Lackenby steelworks, Teesside network, eight 1996/97 built Maschinenbau Kiel built locomotives were purchased from Norwegian State Railways. They were classed as Di8. In August 2014, GBRf purchased 59003 from Heavy Haul Power International, Germany. In 2015, it was confirmed a further seven Class 66s would be purchased. Even though the locomotive type no longer conforms with emissions regulations, GB Railfreight had purchased some spare EMD 710 engines, shipped them to the United Kingdom before the 31 December 2014 deadline and then returned them to the United States for fitting to the new locomotives to be delivered in 2016. On hire from HNRC. 901 & 905 in GBRf livery. ↑ Schabas, Michael (October 2003). Memorandum by GB Railfreight. Hansard (Report). Retrieved 18 October 2012. ↑ "GB Rail Offer Unconditional". Corporate News (Press release). FirstGroup plc. 14 August 2003. Retrieved 18 October 2012. ↑ "Mail to move by rail again". GB Railfreight News (Press release). 18 October 2004. Retrieved 18 October 2012. ↑ "GB Railfreight wins Royal Mail contract". GB Railfreight News (Press release). 20 May 2005. Retrieved 18 October 2012. ↑ "FirstGBRf wins new contact (sic) with Royal Mail". GB Railfreight News (Press release). 15 June 2007. Retrieved 18 October 2012. ↑ Barnard, Bruce (3 May 2010). 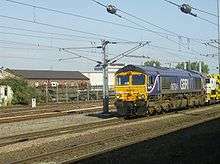 "European Rivals Bid for GB Railfreight". The Journal of Commerce. Retrieved 18 October 2012. ↑ "Eurotunnel buys GB Railfreight from FirstGroup". Railway Gazette. 1 June 2010. Retrieved 18 October 2012. ↑ Bray, Martin (14 December 2011). "Cardiff Tidal Sidings". Tidal, Margam & Canton. Retrieved 18 October 2012. 1 2 "GBRf buys Norwegian locos for steelworks". The Railway Magazine (1329): 85. January 2012. ↑ "GBRf wins IEP test contract for Class 800/801 trains". The Railway Magazine (1351): 80. November 2013. ↑ "IEP trains to undergo night testing on East Coast line". Rail Magazine (738): 16. 25 December 2013. ↑ Trotter, Phil. "Industrial Diesel & Electric Locomotives" (photo gallery annotation). Retrieved 18 October 2012. GBRf's DH50-1 … to replace ageing class 08s here with reconditioned industrial locomotives; … as rebuild no. 9376 of 2011.